I chose the Wildcats for this trip because Patches only needed two more peaks to get to the halfway mark of her 4000-Footer quest, and the Wildcats conveniently had two official 4000-Footers. The Wildcats seemed like a nice obtainable goal as we could start the climb by ascending the WIldcat Ski Area trails, a far less strenuous climb than the Wildcat Ridge Trail from Pinkham Notch. 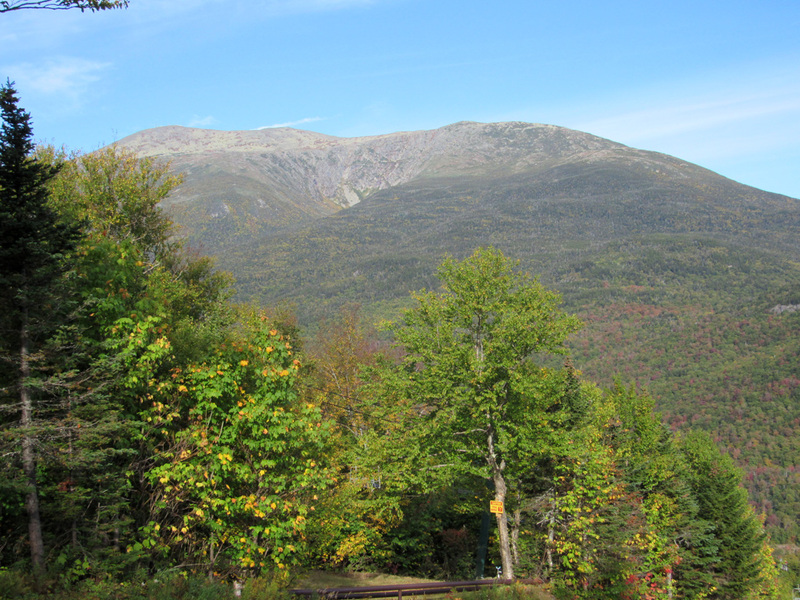 Once up on the ridge, we could take our time traversing the bumpy ridge trail to Wildcat A, descend to Carter Notch, stop at the hut for a rest, and then head out down the 19-Mile Brook Trail. After that, we would hope to catch a ride back to the ski area where our car was parked. If not, it would be a long tiring walk back along Rt 16. But that would be a worry for later on. 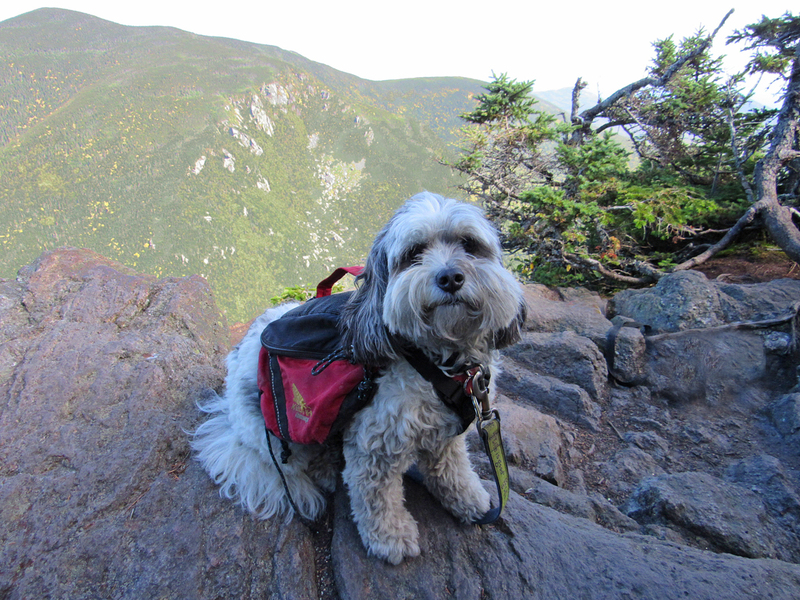 The last time I climbed up the Wildcat ski trails, Muffin and I were making a two-night backpacking traverse of the entire WIldcat and Carter ranges. 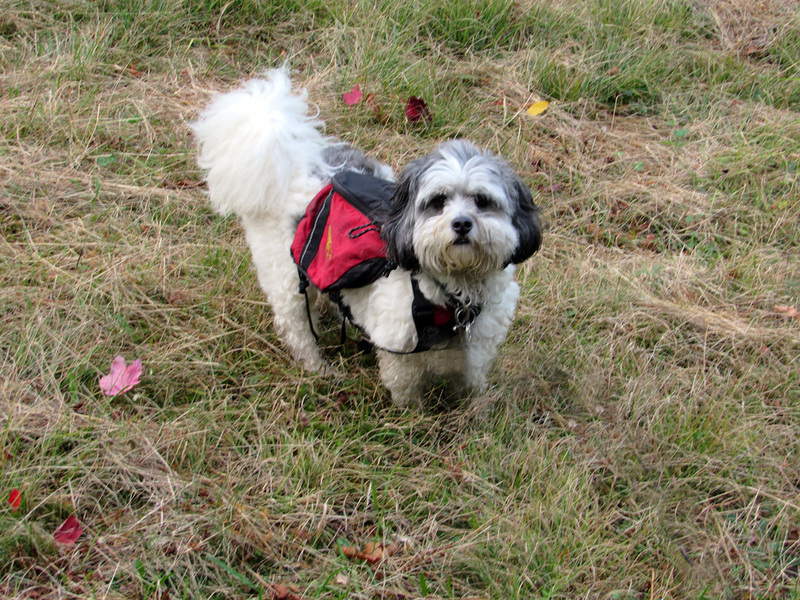 The grass on the ski trails had not been mowed and we were both drenched by the time we reached the top. This time, we got lucky. The grass had obviously been cut within the last couple of days and our ascent was a heck of a lot drier. The sun was shining brightly and the termperature was perfect. All the way up we had great views of Mts Washington, Madison, and Adams, and there was even a bit of fall color in the lowlands. As expected, it was a pleasant hike up to the top of the main Wildcat chair lift, where we sat and rested at a picnic table for a few minutes before moving on to the nearby summit of Wildcat D, where there was a small observation platform that looked out over Pinkham Notch and the Presidential range. I've always wondered why whoever named the five Wildcat summits couldn't have come up with anything better than the letters A through E. It wasn't very imaginative to say the least. 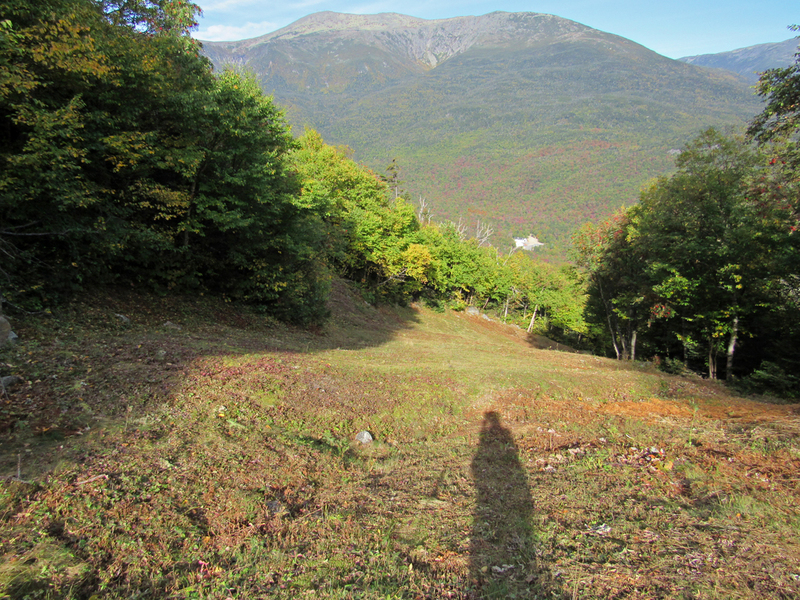 We descended rather steeply from Wildcat D, heading straight down to Wildcat Col, the lowest point along the ridge. After the col came the long arduous slog over the rest of the ridge. Officially, there are the five aformentioned unimaginatively named peaks, but actually there are at least ten mini summits, punctuated by numerous shallow cols. As on previous trips over the WIldcats, I was never quite sure of the exact locations of WIldcats B and C. If they were marked, I never saw the signs. 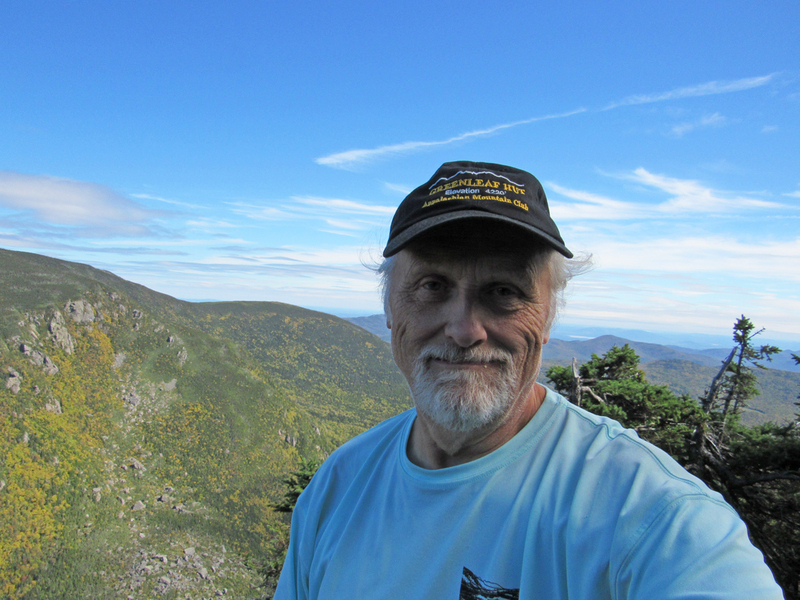 It was with welcome relief that we finally reached Wildcat A with its spectacular views down into Carter Notch and up to nearby Carter Dome. While we admired the scenery and tiny Carter Notch Hut and its ponds below, we shared some Pringles and I ate another power bar. It''s a sheer drop down into the notch from the Wildcat A overlook, not a good place to take a fall, but Patches seemed to enjoy the view and as usual, wasn;t overly cautious around the edge. I, of course, kept the leash on her and made sure that she stayed close by. 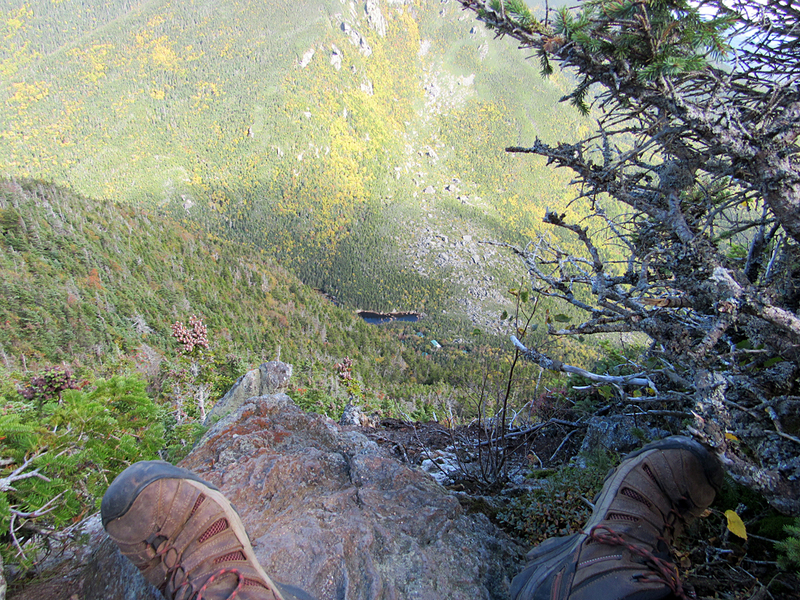 The hike down to Carter Notch went fairly quickly. 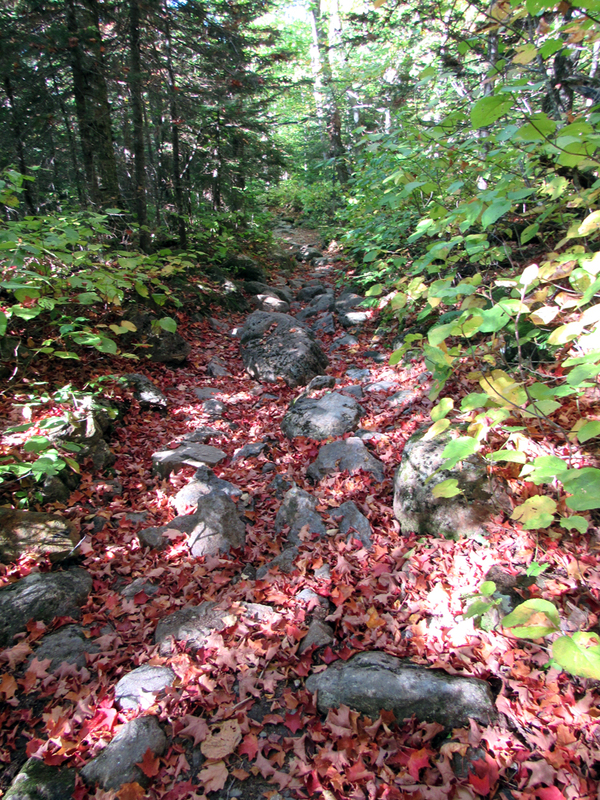 It's very steep, but the trail was dry, and mountain goat Patches had no problem negotiating the rocky path. Along the way, we passed over the slide, a slippery and dangerous spot in the winter but a rather tame crossing now. 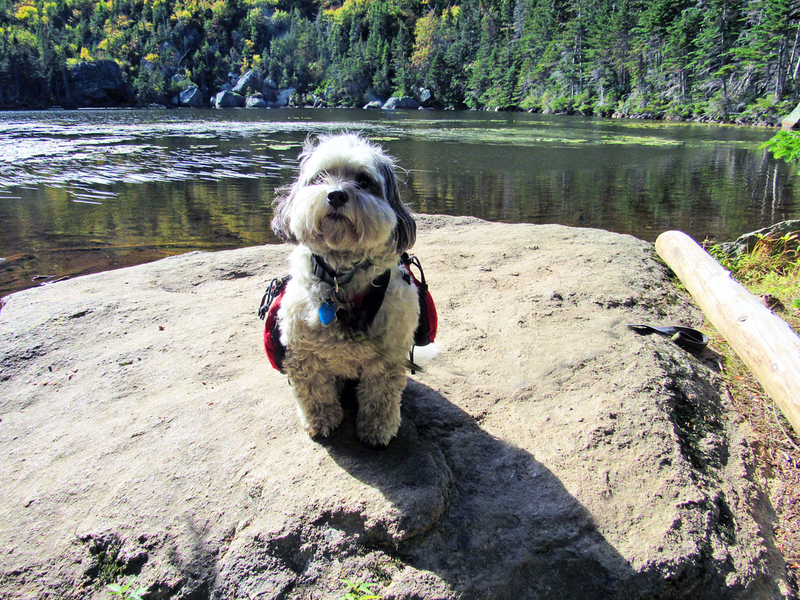 After that, we soon reached the 19-Mile Brook Trail and the larger North Carter Pond, where we stopped so I could take a picture of Patches on a flat rock that jutted out into the water. When we reached the hut, I reluctantly tied poor Patches up by herself outside the front entrance while I went inside to buy a souvenir tee-shirt. I thought about getting a hat too, but wasn't too fond of this year's trucker-style hats. After filling up my water bottle, I went back outside to sit and rest with Patches for awhile. From our vantage point, there was a great view up to the sheer cliffs of Wildcat A, where we had recently sat looking down to where we were now. The Lonesome Lake style bunkhouses at Carter Notch are in back of the main stone hut building but I didn't feel like wandering over there to see if they had been updated. If was getting tired by this point and there was still a long walk back down the 19-Mile Brook Trail, even if it was mostly a fairly gentle, and not overly rough downhill grade. It was a nice walk down, just a little long considering how far we'd already hiked that day. It's hard to fully appreciate the beauty of the landscape when your legs start to feel like rubber and your energy begins to sag. I tried to pick up the pace to shorten the journey but eventually ended up slowing down again. Finally, we reach the end of the trail and the parking area where I'd hoped to find another hiker getting ready to leave in their car. No such luck. The 3-miled trudge back down Rt 16 was a nightmare. I tried sticking out my thumb for a ride but no one stopped, and walking backward with your thumb out only slows the pace all the more. I was extremely tired and cranky, and Patches kept stopping and turning around to look every time a car approached us from behind, even furtther slowing our progress. No amount of pulling on her leash or urging her to move on helped. Every step began to be a supreme effort, and it felt like we were never going to make it. Of course, we eventually did make it and reaching the car seemed like we had reached Valhalla. After a long day's hike, sitting down in the car to rest and just drive is a welcome relief. We were on our way home, back to our family, to a nice restful sleep, and and to recuperate before the next 4000-Footer. Patches near the bottom of one of Wildcat Mountain's ski trails. Mt Adams (left) and Mt Madison (right) from the same location on the ski trail. Rt 16 is also visible in PInkham Notch below. 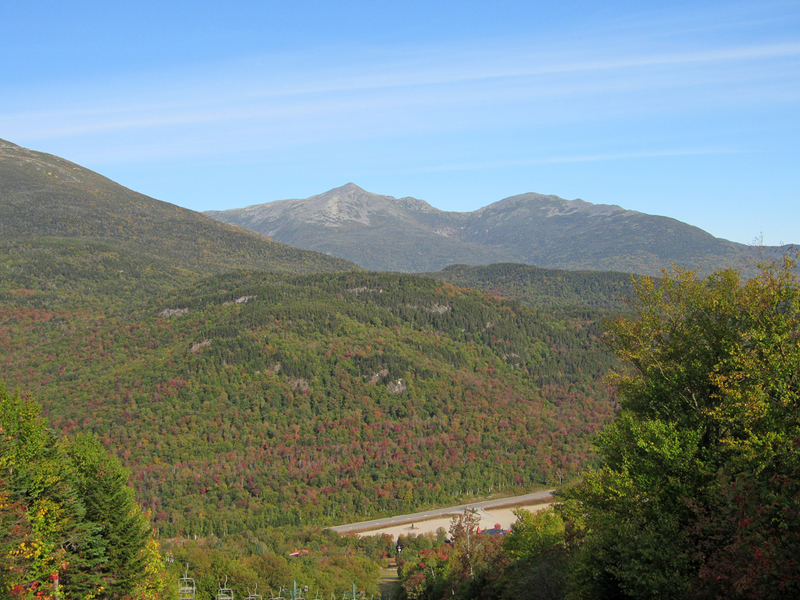 Another shot of Mt Washington from higher up on the ski trails. 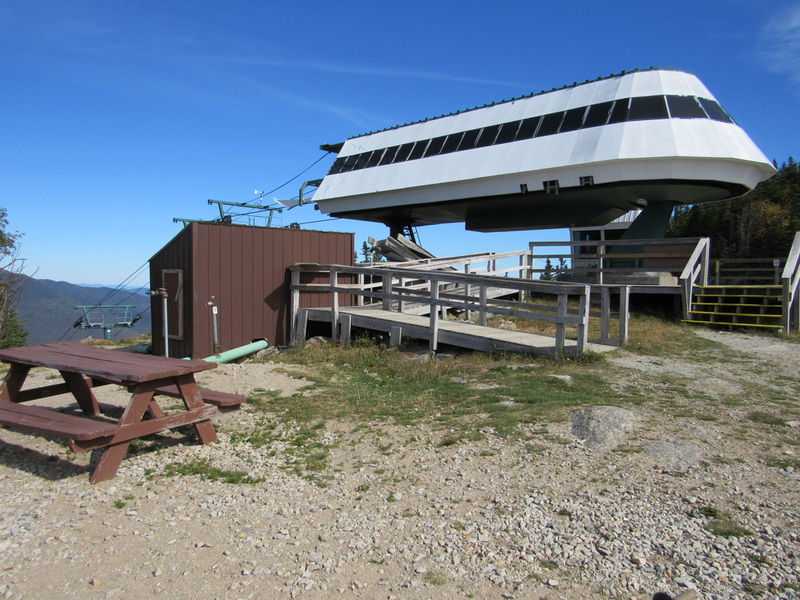 The top of one of WIldcat Mountain Ski Area's chair lifts. This is the highest location in the ski area is not far from Wildcat D.
Closeup of the Mt Washington summit from the top of the ski area. The summit buildings and towers are visible at the top. 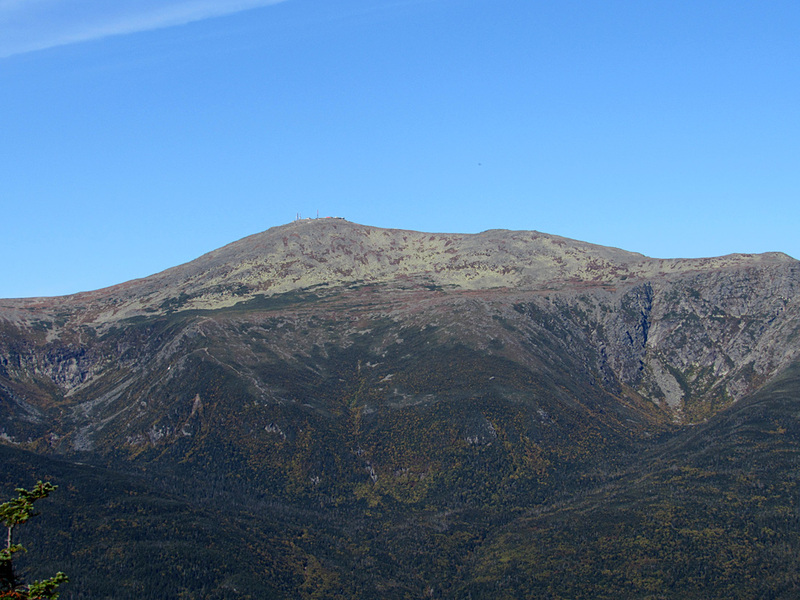 Mt Washington again, this time from the Wildcar D summit observation tower. 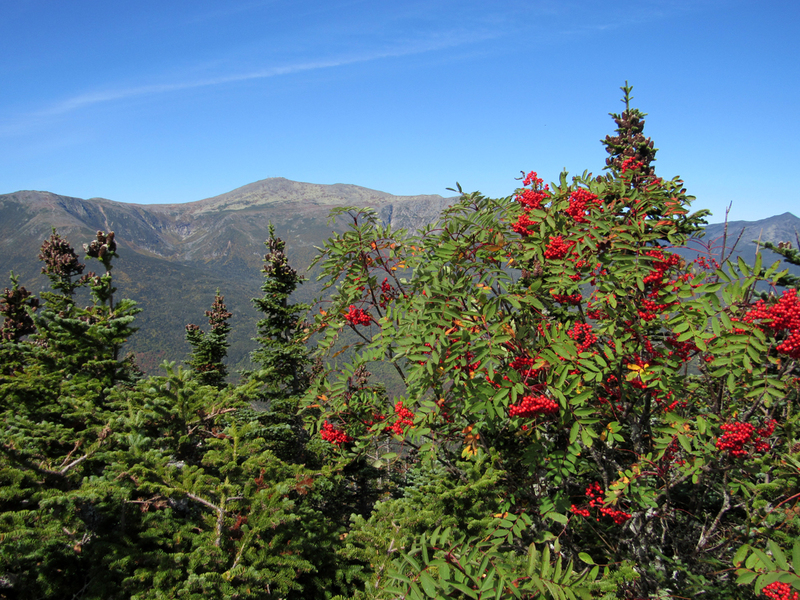 The tree with the bright red berries is a mountain ash. 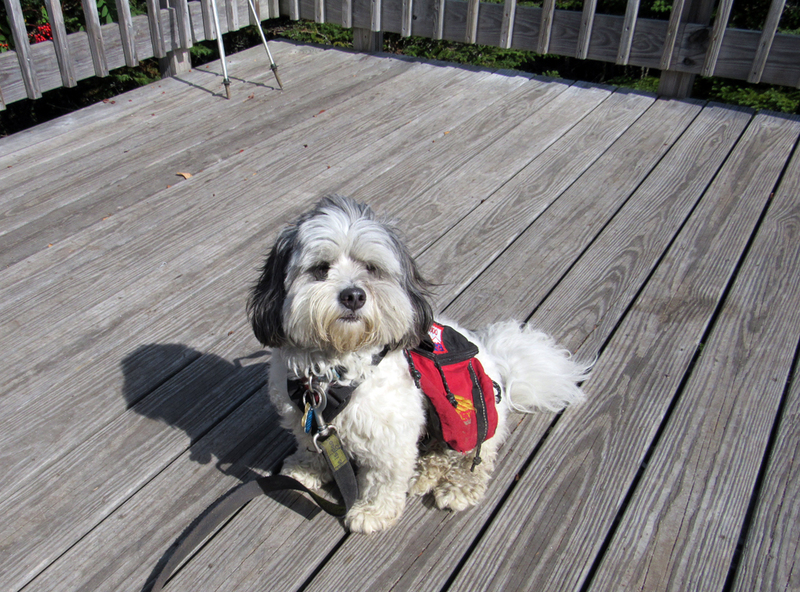 Patches on the Wildcat D summit observation platform, just before we left for the long trek over the bumpy Wildcat Ridge. Looking down into Carter Notch from Wildcat A. Carter Pond and the Carter Notch Hut buildings at visible at the bottom. Patches at the Wildcat A overlook. Behind her in the distance is Carter Dome. Self-portrait on WIldcat A with a view to the southeast. Patches on the shores of Carter Pond, between the Carter-Mortian Trail junction and Carter Notch Hut. 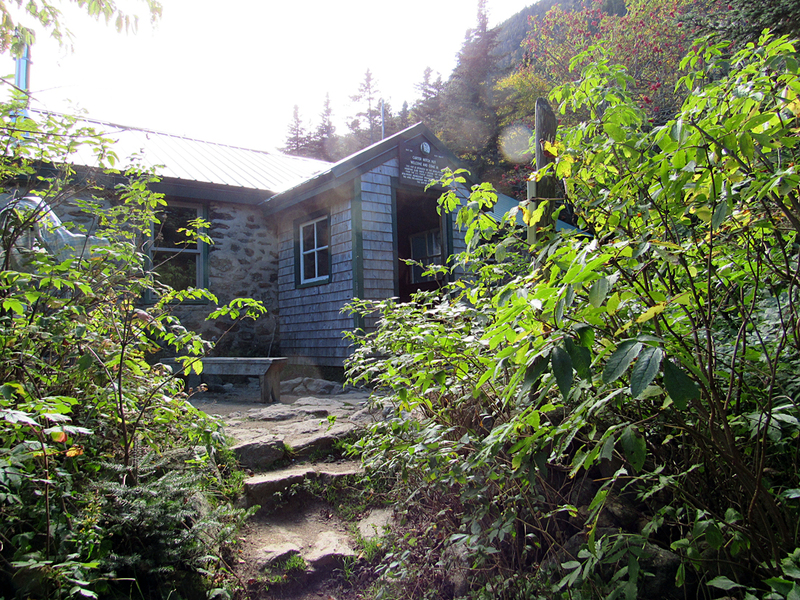 Approaching the front entrance of the fieldstone main building of Carter Notch Hut. Like Lonesome Lake Hut, Carter has two detached bunkhouses in the rear. 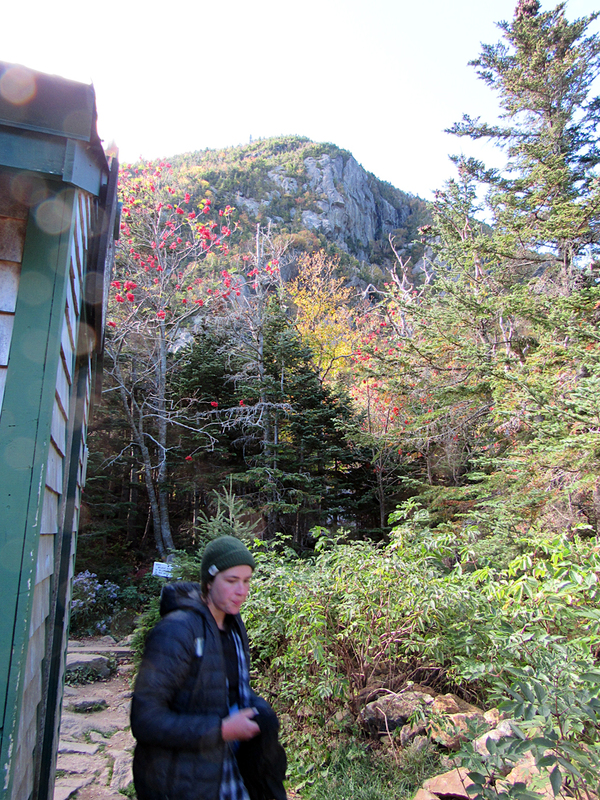 A hiker passes by the hut on her way from the bunkhouses. Above her are the sheer cliffs of Wildcat A. 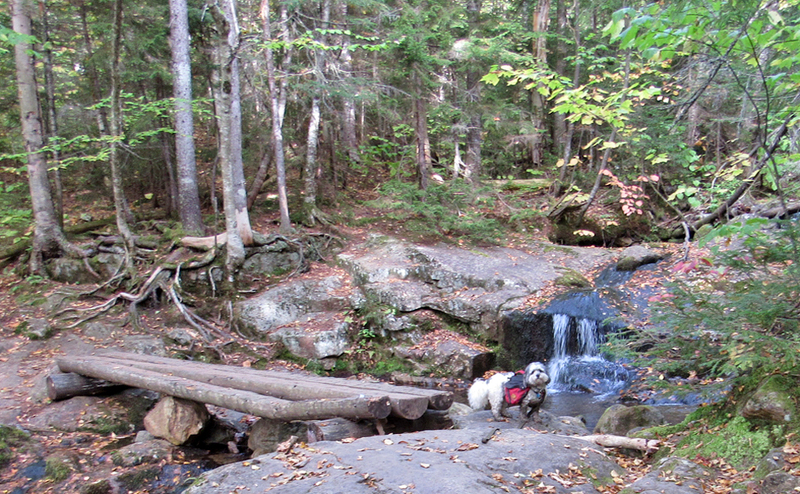 A nice fall scene along the 19-Mile Brook Trail among some fallen red maple leaves..
Patches getting ready to cross the footbridge over a tributary brook flowing down from the heights into 19-Mile Brook.